The Till Valley Archaeological Society (TillVAS) are going to be holding a coffee morning at Crookham Village Hall, Saturday 13th February from 10.00 am till 12 noon. There will be a display of archaeological artefacts. This entry was posted in E Newsletter and tagged Flodden, Northumberland, Till Valley, TillVAS on February 9, 2016 by cbanorth. 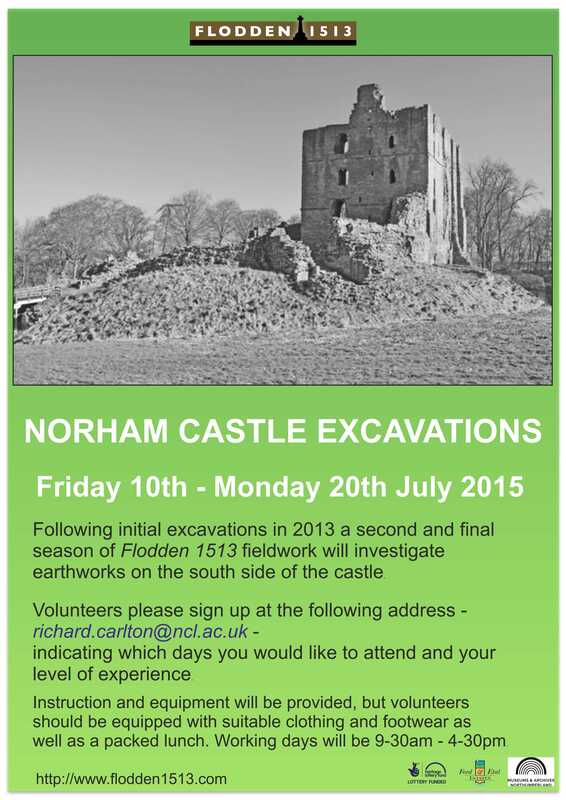 NORHAM CASTLE EXCAVATIONS: Friday 10th – Monday 20th July 2015. Following initial excavations in 2013 a second and final season of Flodden 1513 fieldwork will investigate earthworks on the south side of the castle. Please indicate which days you would like to attend and your level of experience. equipped with suitable clothing and footwear as well as a packed lunch. Working days will be 9-30am – 4-30pm. This entry was posted in E Newsletter and tagged castle, earthworks, excavation, Flodden, Norham on June 28, 2015 by cbanorth. Following requests from several interested parties this two day course will take place in January 31st and February 1st (Saturday and Sunday) and will be based in Norham. The aim of the course will be to look at the basics of archaeological metal detecting, how the project’s standard machines work, how we use them as archaeologists and how to recover finds identified through metal detecting. The first part of the day (31st January) 0900-1300 will be based in doors at Norham Village Hall. The course will them move out doors to examine a field currently under grass in the vicinity of the Norham at Ladykirk on the Scottish side. This practical experience is the best way to learn metal detecting with the support of the project’s metal detecting expert Ian Glendinning. Day two will be to provide a further opportunity to practice (and will for those who missed it on day one provide an opportunity to hear Ian’s indoor talk again). This course is aimed at those with no or limited experience. There will be 10 places per day. Priority on day 2 will be given to those who attend day 1. This entry was posted in E Newsletter and tagged Flodden on January 21, 2015 by cbanorth. Till Valley Archaeological Society (TilVAS) WW1 local history exhibition featuring those who fought and died from Crookham and the surrounding villages. Exhibition and Speaker, Mike Fraser on Sir Edward Grey, Foreign Secretary during WW1 Sir Edward, great nephew of Earl Grey. Sir Edward conducted most of his government affairs from Falloden Hall, Northumberland. Mike Fraser speaks on new research of local conscientious objectors and their tribunals. Local musicians are invited to play during the day. Poppy flowers planted in the garden are blessed and solemn commemoration ceremony. Guided tours of the Peace Garden. Dedication of stained Glass art installation devised by Heather Fisher, in the Peace Garden. Refreshments served throughout the day. 11 – 11. 45am Garden: Ringing of the Peace Bell, Solemn commemoration, and dedication of art installation. 12 -12.30 Meet at Garden Gate: Guided Peace Garden Tour. 1 – 2 Hall: Speaker and Question and Answer time with Mike Fraser on Conscientious Objectors and their local Military Tribunals. 2 – 2.30 Meet at Garden Gate: Guided Peace Garden Tour. 3pm: closing, ringing of Peace Bell. Free event – Donations divided equally between the Crookham Branch of The British Legion and Flodden Peace Centre. Wednesday August 6th 7pm 9pm– Hiroshima Day. 7pm – A short ceremony by the weeping Pear Tree in the Peace Garden. Sabrina taught Arts and Technology at Tweedmouth Middle School. She worked for many years for Eric Lomax while he was writing ‘The Railway Man’, typing up drafts before and after Eric’s visit to Japan to meet Nagase Takashi. Sabrina, 20 years ago, when she was at home with small children, started working for Eric Lomax, typing up the drafts of ‘The Railway Man’ and continued to work on it until publication. She has interesting stories to tell about the experience – in particular the transformation in Eric after he met, and forgave, Nagase Takashi. Kathy Teirnan, local published author (‘Place of Repose’), will lead the book discussion. We may be able to persuade her to bring some copies to sign and sell. The discussion will be yours, feel free to come if you have seen the film or the book or neither! Kathy Tiernan lives in Berwick, and has worked as an English teacher, arts administrator and shiatsu practitioner. She is currently working on an MA in Creative Writing at Newcastle University. Free Event – Donations to the Flodden Peace Centre and towards expenses of guest speakers. The evening begins in the Peace Garden with presentation by George Frewing aged 11 yrs and family, of money raised during The Wooler Wheel cycling event in the spring, sponsored by Doddington Ice Cream and Borders Radio. George raised £270 to contribute to the hand carved oak garden furniture and wooden swords of the combat zone. The Peace Centre is grateful to all the sponsors and to George for making it possible. George Frewing attends St Pauls RCVA Middle School in Alnwick and is very well known for his sporting successes. He plays for Alnmouth Cricket team, as well as Nothumberalnd County Cricket; and plays football for Alnwick and the County. Cycling is part of his fitness training for squash, rugby, and golf at Foxton. His father John Frewing of Warkworth accompanied him on the 30k cycle ride. The Frewings were able to stop for a picnic breakfast and learn about the Peace Centre while on the ride. Refreshments served in the hall, prior to screening. 7.30 pm Screening of film (112 min) Fit for viewing 15 years or more. 7.30pm – 8.30pm Guided Tour of Peace garden for those aged under 15 yrs, and any older people who care to join the tour. The 22nd August 2014 will be the 150th Anniversary of the Adoption of the Geneva Convention in 1864 to protect the sick and wounded in armies in the field paving the way for the 1949 Geneva Convention, of which Japan was not a signatory, during the Second World War. Free event – Donations for refreshments and the Flodden Peace Centre Garden are welcome we require a further £300 towards remaining seating and to purchase some more dark and forbidding trees at the entrance to replace some originals which sadly have not survived transplant in the early days of the garden. Full details and directions to Flodden Peace Centre available at www.flodden1513.com See the events section and the Flodden Peace Centre pages of the Eco Museum website. This entry was posted in E Newsletter and tagged Flodden on August 4, 2014 by cbanorth. Early in March GUARD Archaeology from Glasgow and Volunteers from the Flodden 1513 project carried out a three day geophysical survey at Wark Castle with a view to identifying targets for excavations at the end of March and in early April. The target of this work was a field to the west of the Castle Motte which shows features very similar to those seen in the field targeted for excavations at Norham Castle in 2013. Wark Castle was for much of its life a typical Norman type Motte and Bailey and in important point of contact for international relations between England and Scotland. Along with Norham the castle was the target of a Scottish siege during the first days of James IV’s invasion of England. Little is know about the siege which took place on or around the 22-25 August 1513 other than that the castle fell to Scottish forces. After the Scottish Army was destroyed on Flodden Field the castle was recaptured by the English, and again like Norham was in the following 10 years subject to a redevelopment programme paid for by Henry VIII that saw the motte capped with a new stone artillery tower. For those wishing to take part no previous experience is necessary just a willingness to join in and try it out. Volunteers wishing to sign up can join in for 1/2 or whole days and for individual periods or the whole 10 days. For those wishing to book places please contact Chris Burgess (Flodden500@gmail.com) to book a place on a first come first served basis. This entry was posted in E Newsletter and tagged Flodden on March 19, 2014 by cbanorth.